Arctin Pengiun: Do you feel that a vest patterned to match slack or the rest of a suit is too much and that a vest should always contrast the rest of the outfit? Does this fit into your definition of ‘costume’? I am curious about your thoughts. Tintin: I’m wearing [a waistcoat] now. Lilac with mother mother-of-pearl buttons. The DB vest is sooo British. I’m afraid I’ll be shot for wearing this vest much less a DB. There appeared to be a slight miscommunication regarding my previous posting on double-breasted waistcoats. I have to confess that the illustration I provided was probably at fault: while I was discussing waistcoats that are part of a three-piece suit, and therefore match both the jacket and trousers, the illustration showed an odd (i.e. non-matching) buff waistcoat. The illustration was too lovely not to include, but it obviously led some to the wrong conclusions. All my recommendations in that previous post, and indeed all others relating to The Waistcoat Theory, refer to the third piece of a three-piece suit. This third element is, I maintain, elegant and intensely practical today. When most men in the office don’t wear a jacket, the waistcoat keeps their tie prim and their silhouette long. Odd waistcoats are hard to wear well unless one is at a formal event. For formal daywear, buff (yellow) and a variety of other pale colours have long been worn to enliven an otherwise grey ensemble. The best days to see such an outfit in days gone by were a church occasion, such as Easter. Today, they are only really seen at weddings and horse racing. On these occasions they can look great, though personally I still prefer a pale-grey three piece. Subtle style wins every time. And this is the dominant problem with the odd waistcoat. Tintin’s lilac waistcoat sounds lovely, but I find myself hard pressed to think when I would wear it. Certainly never for work, and it seems an odd item to wear casually – a dressier piece of clothing for a less dressy situation (see image, top). Much of this is personal taste, though, and the wider varieties of casual wear are beyond the scope of this blog. To answer Mr Penguin’s question, no, I believe the waistcoat should nearly always match the rest of the suit you are wearing. If you are to wear an odd waistcoat with a suit the two rules to bear in mind are: keep your jacket on whenever you can; and keep the waistcoat dark and plain. However, that sweater looks good when it is dark and plain, and when it is peeping out from under the jacket. Without the jacket, the outfit is just a sweater and slacks – the style has gone. Suddenly the sweater is the outfit, rather than being an accent. So for odd waistcoats, think plain complements. For example, I have a dark-grey three-piece suit. The waistcoat looks good under a lighter grey check suit. I also have a tan herringbone waistcoat that I think works well with a dark brown suit. You can follow the discussion on Reader question: Odd waistcoats by entering your email address in the box below. You will then receive an email every time a new comment is added. These will also contain a link to a page where you can stop the alerts, and remove all of your related data from the site. I, too, tend to use a waistcoat as an accent. Specifically, a white linen one that I wear under a two piece charcoal chalkstripe with a grey bodied, white collared/cuffed shirt and a black and cream spotted bowtie. My pale greys go under blue chalkstripe suits. The patterned ones I wear under plain suitings that compliment one of the colours in the waistcoat. All of mine are odd waistcoats, though. I would be careful about using the third piece of a three-piece suit as an odd waistcoat. Especially if it is a stripe. But that’s just me. If in doubt… as you so rightly say subtlety always takes the day. For some reason, I’ve never been a fan of odd jackets. I often feel similarly about vests treated as odd pieces, save for use with particular outfits. Perhaps in my mind there is a stronger distance between casual and formal (though your post on the likeness of casual and formal attire was quite informative), thus when I feel like being dressy, I go for a suit, and when I feel like being casual, I either tend to be more tropical (linen pants and a light polo style shirt or a very lightweight button up) or I go for something I don’t have to worry about getting dirty (jeans and a polo, or a t-shirt), and it’s with the most casual of these outfits that I feel the odd vest, a darker one, slim-cut and in a solid color, would most benefit the outfit as an accent. Then again, when thinking of older, achetypal examples of these various outfits, the looser, older style compared to the more modern examples, trimly cut, seem worlds apart. It’s the image of J.P. Morgan versus the image of Tom Ford. Maybe fit really is everything! Odd waistcoats work well at the extremes of the formality scale. 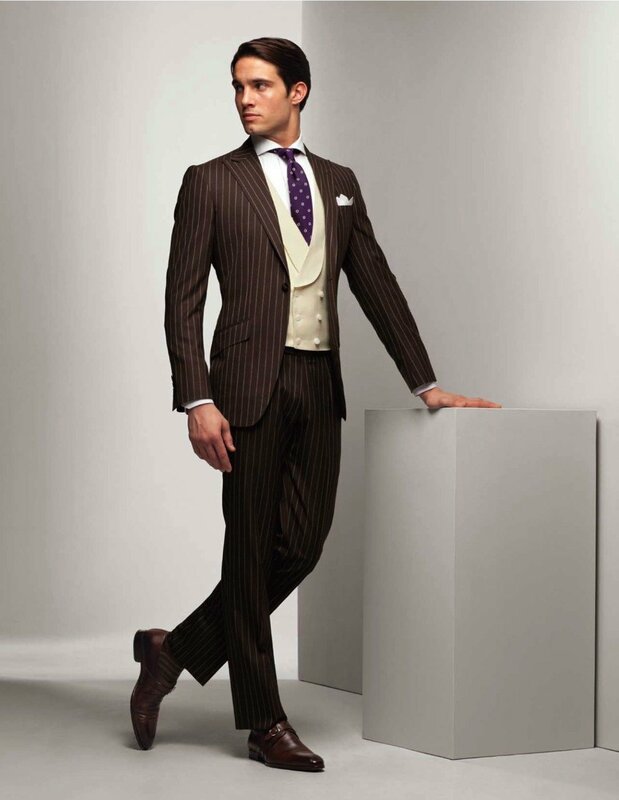 A buff waistcoat (linen in summer, wool in winter) is perfect with morning dress. Alternatively, a boxcloth waistcoat in bright red or yellow or maybe a tattersall is great with casual country clothes. An odd waiscoat with a suit is . . . well, just odd. It’s a look that’s dandified in the extreme – and as such, very few people could get away with wearing it. Maybe another idea is a John Bull style Union Jack waistcoat! I often think that matching trousers and waistcoat with a contrasting jacket gives a nice sartorial casual look not at all formal but elegant enough to warrant a place in any gentleman’s wardrobe.